Announcements from state Sens. Wendy Davis, D-Fort Worth, and Tommy Williams, R-The Woodlands, doubled the number of senators who won't be back in 2015. And there could easily be more. Add two names to the list of departing state senators, one expected and one a complete surprise. Sen. Wendy Davis, D-Fort Worth, is running for governor. Just play like you didn't know that was coming. The surprise came the day before. Sen. Tommy Williams, R-The Woodlands, announced less than a year after he was sworn into his latest four-year term that he will be resigning from the Texas Senate before the first gavel of the regular legislative session in 2015. That brings the certain turnover in the 31-member body to four, and the possible turnover to seven. Sen. Dan Patrick, R-Houston, is running for lieutenant governor, and Sen. Ken Paxton, R-McKinney, is running for attorney general. They would each be up for re-election next year, so their decisions to run mean they won't be back in the Senate. Sen. Glenn Hegar, R-Katy, is running for comptroller; should he lose, he would return to the Senate for the last two years of his term. Meanwhile, three midterm Democrats — José Rodríguez of El Paso, Carlos Uresti of San Antonio and Leticia Van de Putte of San Antonio — have been in conversations about statewide runs. Van de Putte is considering the lieutenant governor's race; the other two are prospects for attorney general. That's without anyone unexpectedly losing a bid for re-election. • The Davis seat will be difficult for the Democrats to keep. U.S. Sen. John McCain won 52.1 percent of the vote in the 2008 presidential race, and former Massachussetts Gov. Mitt Romney won 53.3 percent in the 2012 presidential race in that district, and Gov. Rick Perry won with 52.7 percent in 2010. Down the ballot, where voters are less likely to recognize the names, there is a big difference between presidential and gubernatorial years. Candidates in statewide judicial races just broke 50 percent in 2008 and didn't do much better last year. But 2010 — a big Republican year and also one without a presidential campaign at the top — saw down-ballot statewide Republican candidates getting 57 percent or more. Davis never tried her luck in a gubernatorial year in the district. • SD-10 votes much like the state as a whole, but not quite as strongly. Statewide Republicans did 3 or 4 percentage points better in Texas as a whole than in Davis' district. But they all won, which is something they haven't done in other Senate districts held by Democrats. • It’s really unusual to have both of the top legislative budgeteers leave at the same time. House Appropriations Chairman Jim Pitts, R-Waxahachie, already announced that this will be his last term. Williams’ departure puts the Senate in the same spot. Or worse, since that body might also have a new lieutenant governor in place next session. Lt. Gov. David Dewhurst has been deep in the budget numbers since he got here. If he loses his re-election bid in 2014, both the new lieutenant governor and the new finance chairman will be on a steep learning curve. • The resignation is a rare complete surprise. Williams didn’t tell anybody he wanted to find a new line of work, save perhaps the folks at Texas A&M, who are trying to close a deal that would add him to their intergovernmental relations staff. And just a few months ago, he was openly considering a run for comptroller — just the opposite of getting out of politics altogether. 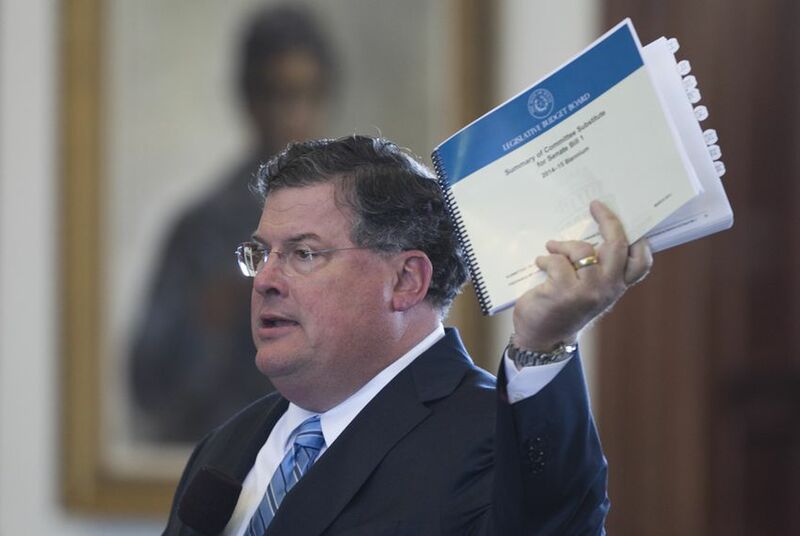 • Williams was on the conservative end of the spectrum when he came into the Senate, but the spectrum moved with the elections of senators like Brian Birdwell, Kelly Hancock and Paxton. He could be replaced by someone whose politics are more like theirs than his. The line is already forming, sort of: Rep. Brandon Creighton, R-Conroe, might give up his bid for agriculture commissioner and run for SD-4 instead; Rep. Steve Toth, R-The Woodlands, is looking; Ben Streusand, a serial Republican candidate who doesn’t hold office, is also considering it. This is a big deal inside the Senate. Williams was often on the prevailing side in internal squabbles and caucus debates, known to tap the brakes from time to time to keep things from spinning into the partisan swamps so popular in the national capital. Someone — it is not clear who — will step into that role. Someone always has.